Category A — Got to the deer camp about 10:30 p.m. with a bag of McDonald hamburgers. Probably slept on a borrowed sleeping bag or an old mattress or maybe in an old recliner that was in such bad shape the Waste Management folks didn’t even move it from beside the dumpster last summer. Covered up with his hunting jacket. Probably woke up at 3 a.m., went to the stand early and passed the time on Facebook and texting other Category A hunters. Got sleepy right after daylight and drank two 5-Hour Energy drinks. Had trouble sitting still in the stand after that. Age group 18-35ish. Category B — Got up the second time the alarm went off (thank goodness for snooze buttons) not because he heard it, but because his wife threatened to hide his hunter orange if he didn’t get up and let her go back to sleep. Frantically rushed out the door after rounding up his gun, some shells of different sizes and his boots. Could have looked at the weather forecast yesterday, but didn’t think about it. Parked on the road and walked in wishing he would have remembered the ThermoCell. And new flashlight batteries. Couldn’t text much because he forgot to charge his phone. And who knew it was going to rain? Fell asleep in the box stand about 8:30 and called it a day when he awoke at 10. Told others in his hunting club he saw four or five small ones, but no shooters. Age group 35ish-45-ish. Category C — Got up at 4:58, right before the alarm clock that was set for 5 a.m. went off. Sipped some coffee (or Dr Pepper 10). 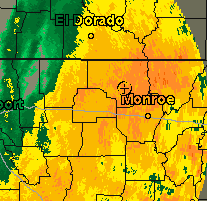 Scanned the newspaper and looked at weatherunderground.com online to confirm the big blob of green and yellow heading our way about daylight. 100% chance of rain. Slightly raised a window on the back porch so the sound of the soft rain could overcome the caffeine in the coffee/DP10 and went back to bed. Woke up again at 6:15 when the wife suddenly realized he was still asleep. “Aren’t you going to the woods?” Nope. It’s raining. Will head back to the stand later in the day, when the green and yellow is gone. Everything was packed and organized in the truck and ready go to anyway. That’s the way we old guys roll. Age group…Hey, we don’t have to tell. « What are you made of?